E-mail bluestemkennels@gmail.com to be placed on the list should someone back out of taking home one of these puppies! As of right now, they are all spoken for. The soonest the puppies can go home is on Monday, April 29th and I’d like to have them all out of the door by Sunday, May 5th so that I can get ready for my daughter’s high school graduation a couple of weeks later. The “P” Litter of 2019 between Ruth and Zoro arrived on Monday morning, March 4th. Ruth began whelping right before I got out of bed at 6:30 AM and finished up by 11 AM so it was very quick. Five girls and three boys. The whelping went very smoothly and the puppies are growing quickly! Here is a photo of them right before bedtime on Monday. The pups went to the vet Tuesday afternoon to get their tails docked and their dew claws removed. My vets were on vacation and it was a substitute vet, so I was too busy talking to get any photos. I take of 1/3 of the tail and leave 2/3, the longest allowed by the AKC breed standard. I think that it make their point look more stylish and helps them use their tail as a rudder for direction when swimming in the water. The AKC standard states that the tail should be docked to 1/2 to 2/3. The temperatures are starting to warm up here, so with supplemental heat the pups will be moving out into the attached garage over the weekend. Not that I don’t love having them in the kitchen where I can be with them all of the time, it is just that after whelping the mother females lose their housebreaking with the amount of food that they have to eat and it makes for some nasty cleanups overnight and when I need to leave the house for a few hours. I am very excited to watch these pups mature, as this is the mating that I am planning on taking the next generation of my kennel from in a new years. 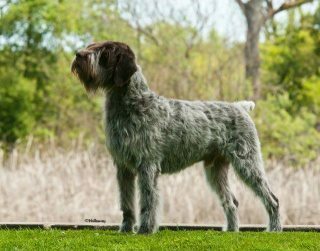 It will be the fifth generation of Wirehaired Pointing Griffons that we’ve owned and the fourth generation and we have bred. It is exciting and pretty amazing how the last nine years have flown by. Caleb is still my head puppy hugger and does not know life before the annual arrival of the puppies. He is so good with them and checks up on them almost hourly. Caleb loves puppies so much that he has asked that his birthday cake is decorated with Griff heads this year! Here’s a collage of some of the photos that I took today. I don’t take individual photos until their eyes open in another ten days or so. And one more of everyone before I close out before the weekend. Catch up with all of you next week with one week old photos and video. All of the “O” Litter puppies are spoken for at this time, please e-mail bluestemkennels@gmail.com to be placed on a list in case of a last minute backout. The four week old “O” Litter puppies are enjoying the outdoors more and more as the weather warms up. They are in the transition to solid kibble and not quite ready to leave the dog house and kennel. Next week they will start to show interest in roaming the yard. Just this afternoon we took our other dogs: Zoro 10 weeks, Ruth 15 months (and the sister of the above litter), and Chief 2 years all out to the pond for some retrieving work. At least Ruth and Chief, Zoro primarily watched. Puppies on the way and pupdates! 12 year old Trey gave me an update on how 10 year old Sue is doing up in South Dakota. He says that he is finally licensed and has a shotgun and is ready to shoot some birds over her. We miss Sue and my youngest boy Caleb (age 4 1/2) asks about her at least once a week. We want to keep our dog numbers at 4 here at the house, so that we can hunt them regularly and give them personal attention, so retirement and re-homing is a necessary sadness. But we are so happy to give folks an opportunity to experience the griffon who might not be able to afford or have no desire to raise a puppy. I can’t wait to see pics of Trey and Sue with some birds in the fall!! I really appreciate all of my puppy owners who contribute photographs and stories of their dogs as they grow up. It is truly the reason why we do this. 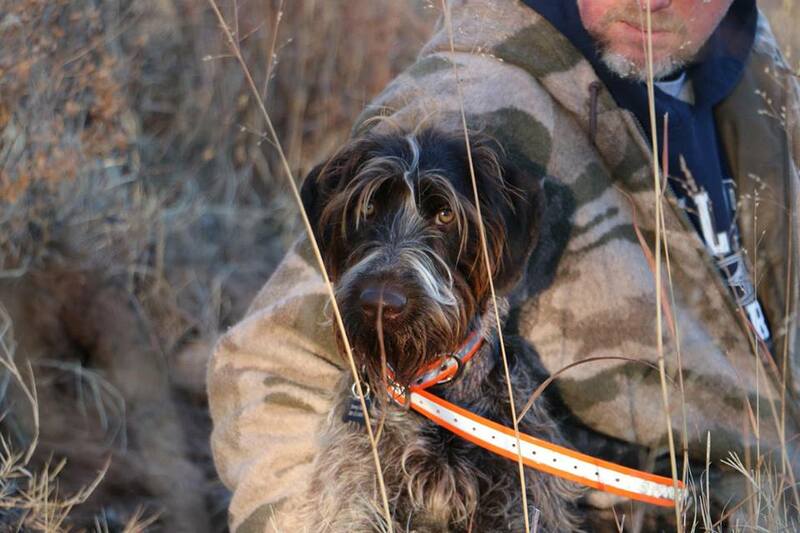 Great job to sharpshooter Andi and our oldest boy Whiskey, who will be four years old soon! He is from our first, or “A” litter in 2010 with Sue and Sam. 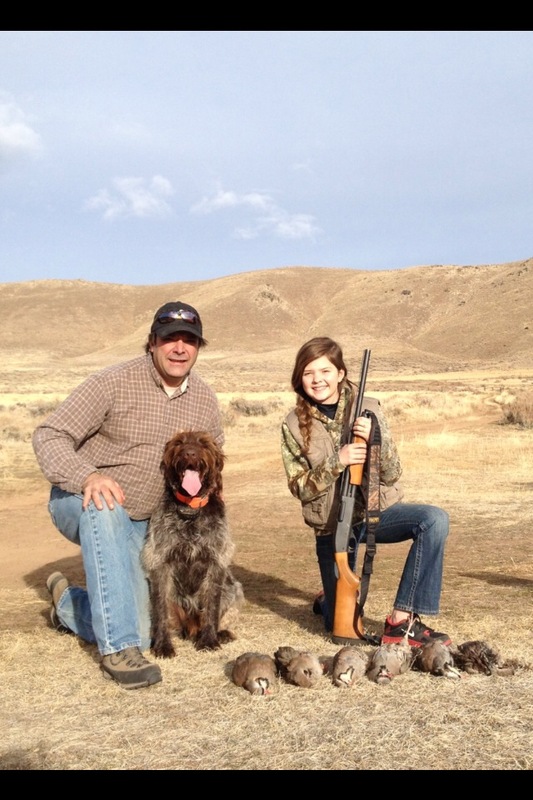 Andi and Whiskey really tore it up in the chukar field and we couldn’t be more proud!! Thanks to Pete, Deborah and Andi for giving him such a great life out in Nevada!! We received a lovely Christmas card with photos of Chester from Sal and family out in New York! 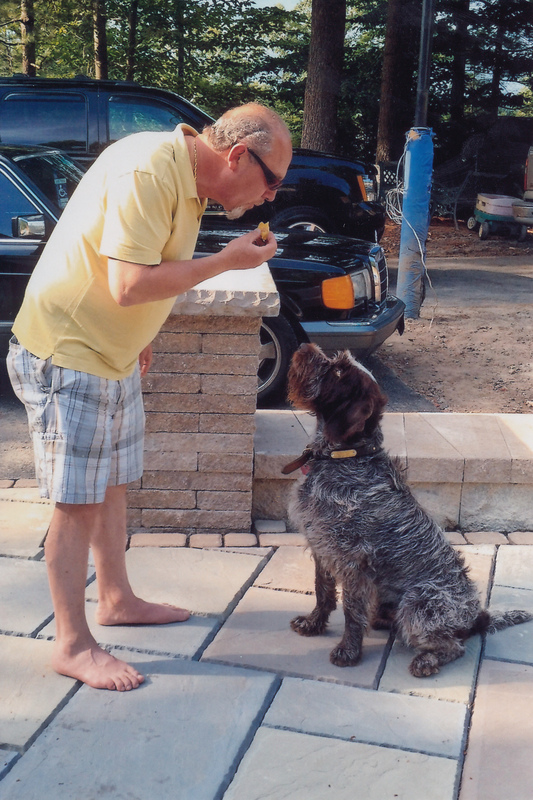 When Chester isn’t out with Steve “Hoss” Anker training or out with the Hudson Valley NAVHDA Chapter, he’s having a good time at home on Long Island. 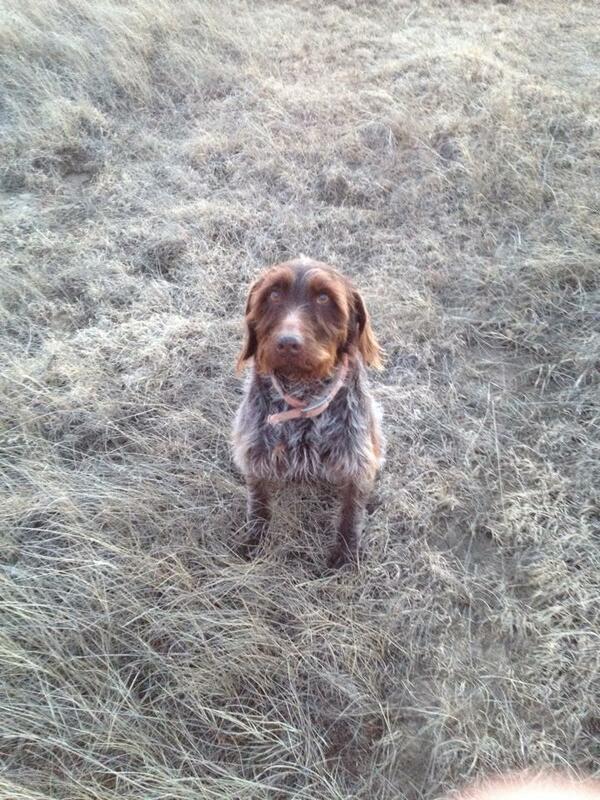 He is from our 2012 “C” litter from Sam and Mae. Sal has done a great job working with this dog and he has a bright future ahead! 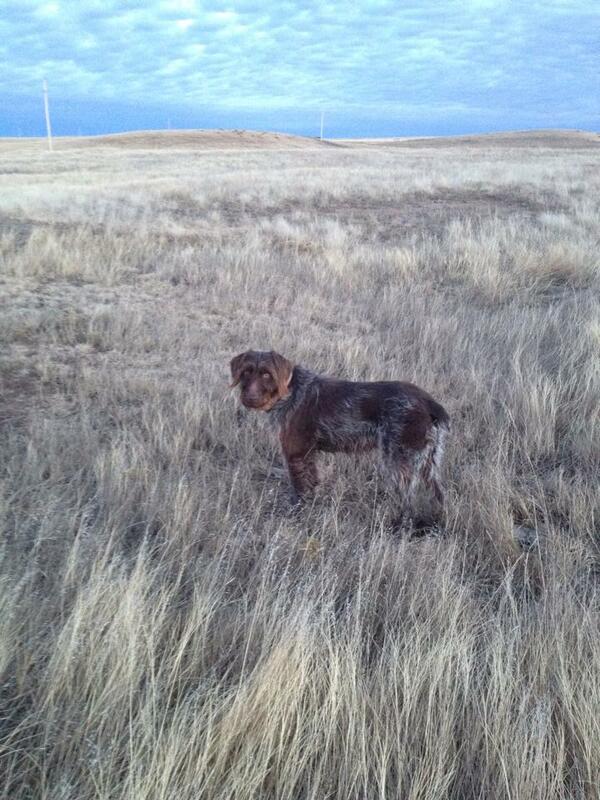 Chester’s “C” litter sister TracHer is having a good season up in North Dakota. 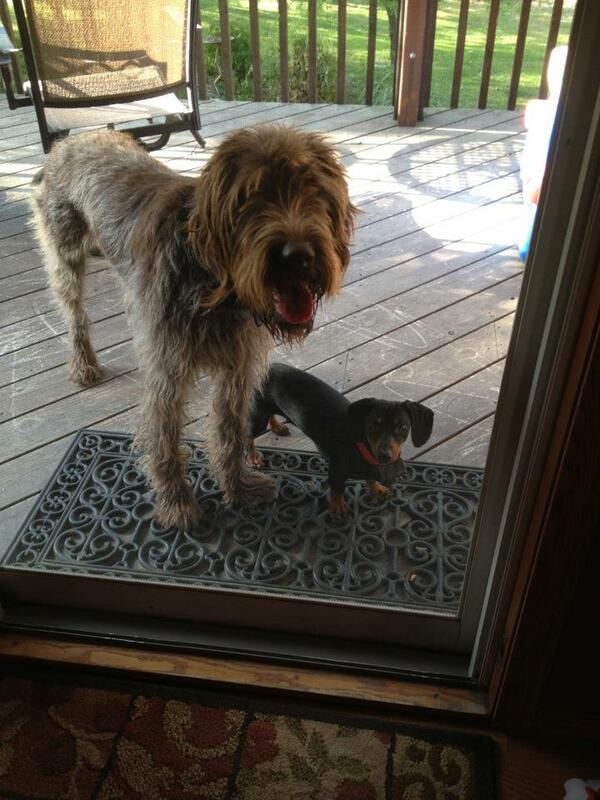 She has a new brother, a 10-month old German Wirehaired Pointer named Max. Thanks to Susan and Tom for the lovely Christmas card with photos. Tom had surgery is on crutches from a knee injury incurred while hunting, so we send prayers for a speedy recovery. This girl is the best thing that every happened to Sandi and me. Here some updated photos. She is now 10 mos old and weighs 55 lbs. We just bought some land in the badlands of SW Oklahoma and she loves it. Here is some photos of her expeditions so far. She loves hunting antlers and when go into the shop she will go to the gun safe and sit there until I either get a gun out or tell her we aren’t going hunting. Zoey and her mallard haul! Thank you so much again to all of my owners for contributing to this and keeping me up to date on how their dogs are doing. It is really important for us to see their success, it keeps us going during the times that we find the pressures of breeding overwhelming. 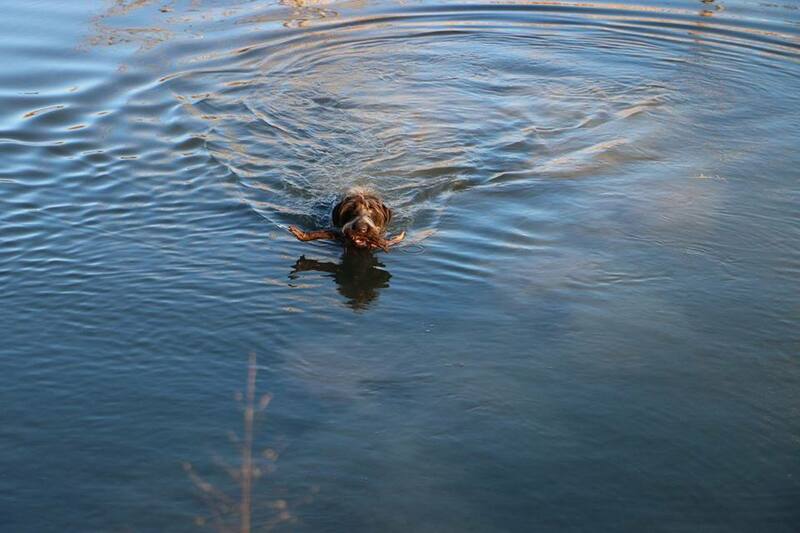 Watching the gun dog lifestyle continue in our pups is one of our greatest joys. I will be sure to keep everyone posted on the upcoming litters. BB is already heavy and I need to get some pictures of her, along with updated shots of the rest of the dogs. I’d also like to do video of Tor. Now that I’ve recovered from travel, the holidays and a major plumbing project, I will do a better job of keeping the blog updated. Charles and Matt are out right now trying to spook up some pheasants, all of the chaos lately has really cut into their time in the field. Until then, stay warm and don’t blow away in these winds! Saturday, September 22nd was a big day for AKC field events in the Lincoln, Nebraska area, so the kids and I hit the road to visit friends and family involved. 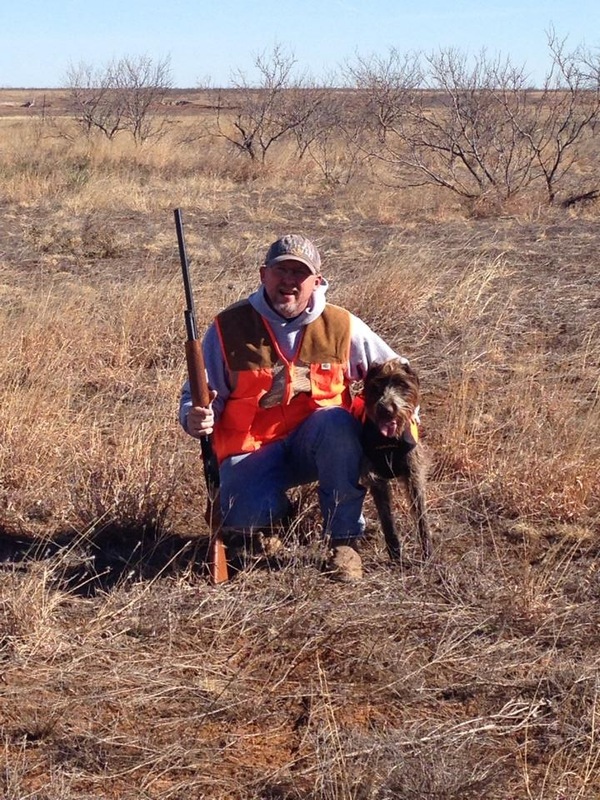 Our first stop was the Missouri Valley Brittany Club’s AKC Hunt Test at Yankee Hill Wildlife Management Area just southwest of Lincoln, near Denton. Although Charles and I lived in Lincoln for a couple of years in the 1990’s, I had never been to this WMA. It is very nice, lots of good cover and space, I can see why the Nebraska Game and Parks selected it as a new spot to plant pheasant for the youth hunting weekend in October. Yet I digress. 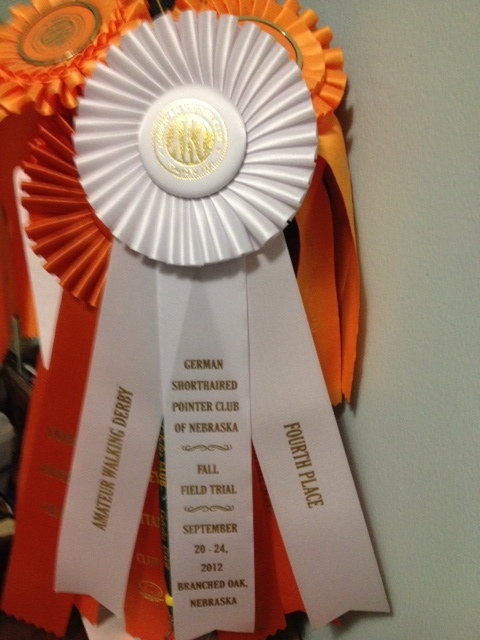 I was headed to the test to visit with my friend Sally Jo Hoagland from North Platte. 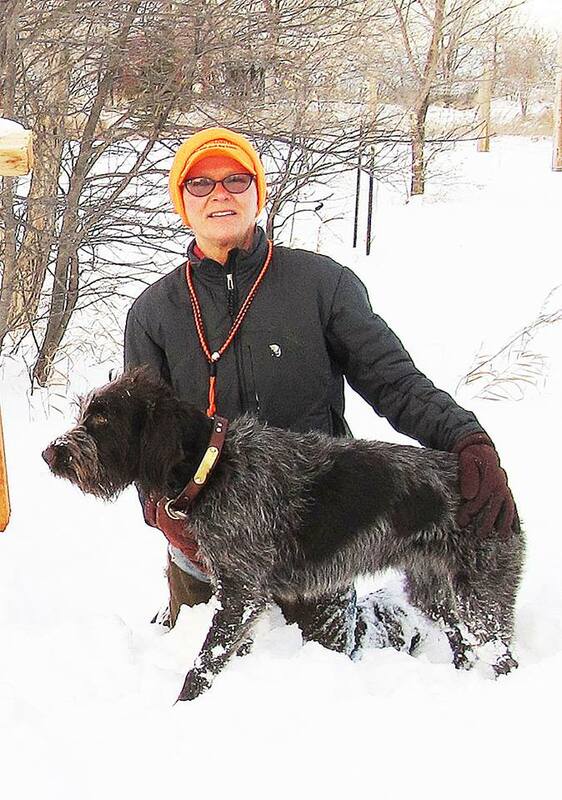 Although she is probably closer to my mom’s age than mine, she is one of the top (if not THE top) Weimaraner breeders in Nebraska (Weimshadow Kennel) and one of the only professional dog trainers in Central Nebraska (Four Paws Dog Training). We had met at the Grand Island Kennel Club Dog Show earlier in the year after first connecting on Facebook, due to our mutual involvement with NAVHDA and AKC. It was funny that at the hunt test I not only knew Sally Jo, but probably 90% of the people at the test and what was even funnier is that we were not the only family of spectators. The hunt test environment is very family friendly, there are usually multiple families with elementary age children running about, so we all look out for one another’s kids and there is never any worry about any of the dogs being mean. The dogs typically sit quietly in their crates or on their stakeout chains and love to have the kids mess with them. Following lunch at the hunt test and a good visit with friends and fellow local hunt test junkies, we loaded up and headed north to Branched Oak Field Trial Grounds near Raymond. Although we had been there for hunt tests in the past, this field trial environment was completely different. 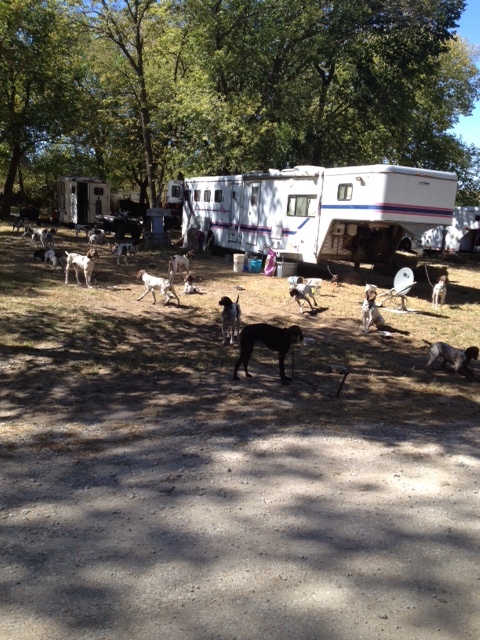 The German Shorthaired Pointer Club of Nebraska’s field trial over last weekend was four days long and had 235 entrants, making it one of the largest AKC field trials of the entire year. Our “camp” was out in the back 40, so when the kids wanted to go to the clubhouse to get some sweets and sodas, we had to wade through the melee. As most field trials are on horseback, most of the other camps consisted of a camper/horsetrailer/dogtrailer combo, a stakeout chain of 10-25 dogs and at least one horse. Anytime someone walked down the dirt road in the midst of the gypsy village, all 235 dogs barked and spazzed out on their chains. This was with the exception of BB of course, who really wanted her people very close to her in this strange setting. I don’t think that any of us were comfortable and felt pretty alien: a family with small children and one griffon surrounded by herds of barking shorthairs, German Wirehaired Pointers and Vizsla dogs along with their owners who reminded me of the rodeo crowd; not sure if their faces are red from being sunburned or last night’s whiskey, or both. The only time that I saw any other women is when they came out of their campers to water their dogs or smoke a cigarette. Maybe I’m only drawing these caricatures because I was nervous and scared that my 3 year old was going to wade into a pack of freaked out hunting machines. I don’t want to hurt any field trialer’s feelings and I’m sure we’ll be back for more, so I’ll get more comfortable and quit seeing things that make me want to point them out. But as the hunt testing environment is where my fellow griffoniers find themselves, I wanted to point out the differences before anyone else decided to strike out into the field trial world. Not that I have any serious ideas of other griffoniers going this route, as a few of them have raised questions about participation. Our take on it is that Korthals wanted to breed a foot hunting dog that was faster than the bootlicking continental breeds of his time. 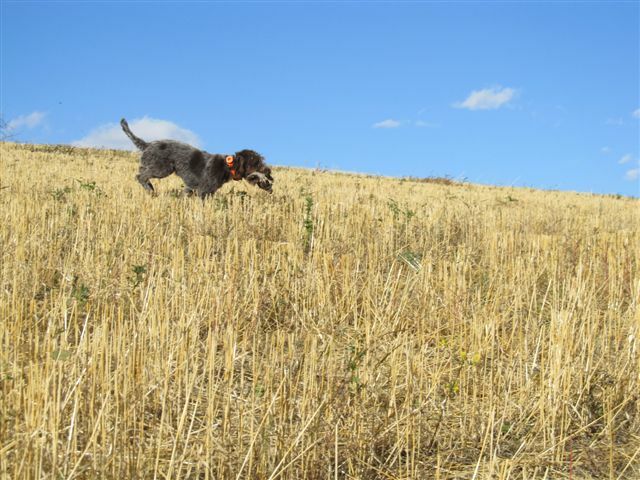 We do not believe that hunt testing does enough to test the athleticism and endurance of the animal, as it is a brief exercise that is only looking for the dog to satisfy the training requirements of the test (search, pointing, retrieving, steadiness, honoring etc.). Even in NSTRA and BHU trials, the field is too small for it to be a valid test of athleticism. We intend to continue to participate in walking stakes at AKC field trials and other trialers at the event encouraged Charles to look into American Field’s Region 19 events. In my brief readings on American Field Region 19, these are events that last longer than an hour and are on open terrain and wild birds, which is a lot like what we are doing for hunting anyway, where we walk for at least an hour before stopping for water and usually two hours before we really stand or sit around for any lengthy period of time. I would suspect that BB would be the first griffon to ever participate in American Field, should we decide to check it out. BB placed 4th out of 5 in the Amateur Walking Derby stakes last Saturday, beating out a Vizsla her same age, working the terrain more thoroughly and having the one bird find of the run. Although we are flying in the face of current convention with the breed, we worry more about the prevelance of designer house pets and conformation show-only dogs than about our involvement in walking stakes at field trials. I really just wish we could channel the spirit of Korthals to ask him himself, but in the meantime we’ll just keep doing our research to support our methods and having fun with our dogs. 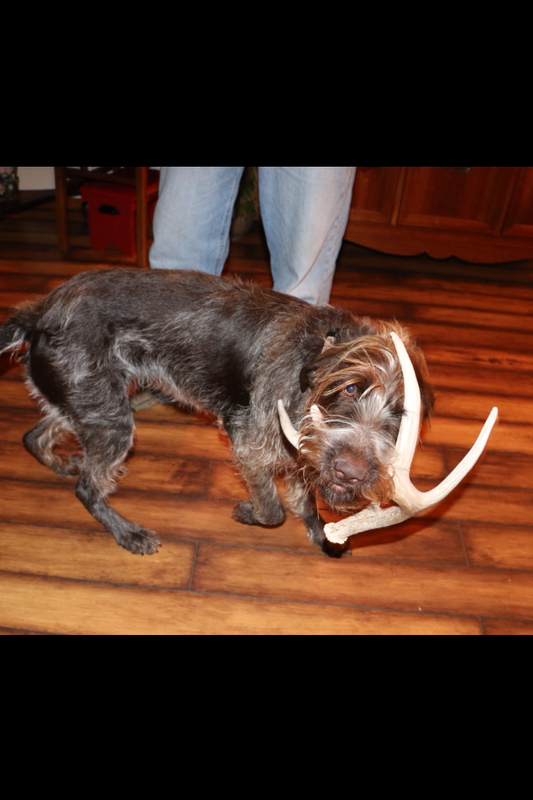 TracHer is busy as usual in North Dakota, she’s 7 months old now and been out on a few sharptail grouse and Hungarian Partridge hunts. She’s even retrieved a few of them! 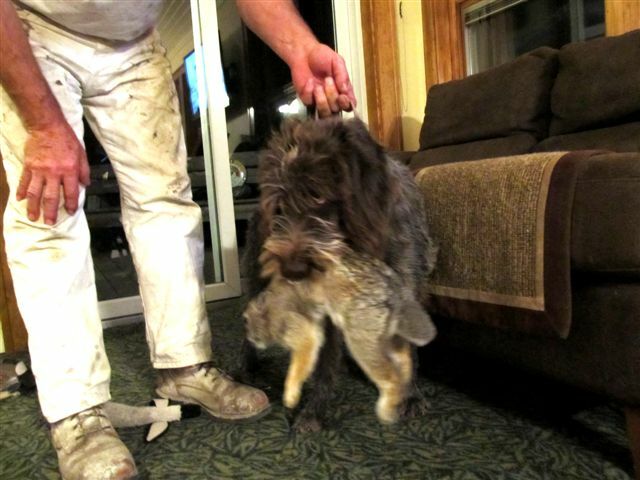 Most recently, she brought a live rabbit into the house through the doggie door while company was over, luckily they were fellow hunters! 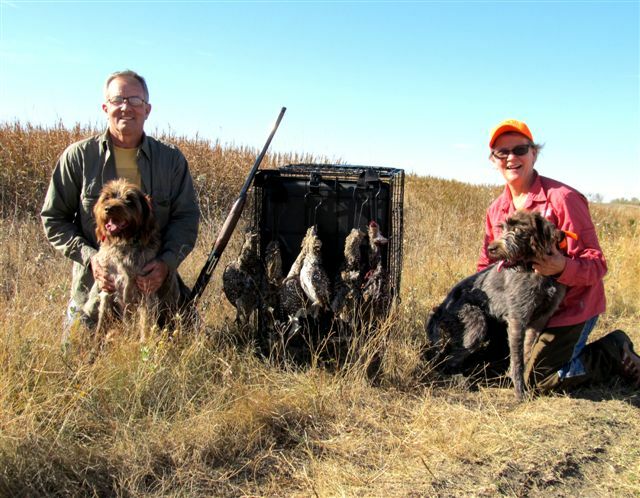 TracHer on left (7 month old Wirehaired Pointing Griffon) with Susan and her old buddy Zephyr with Tom and their limit of sharptail grouse! 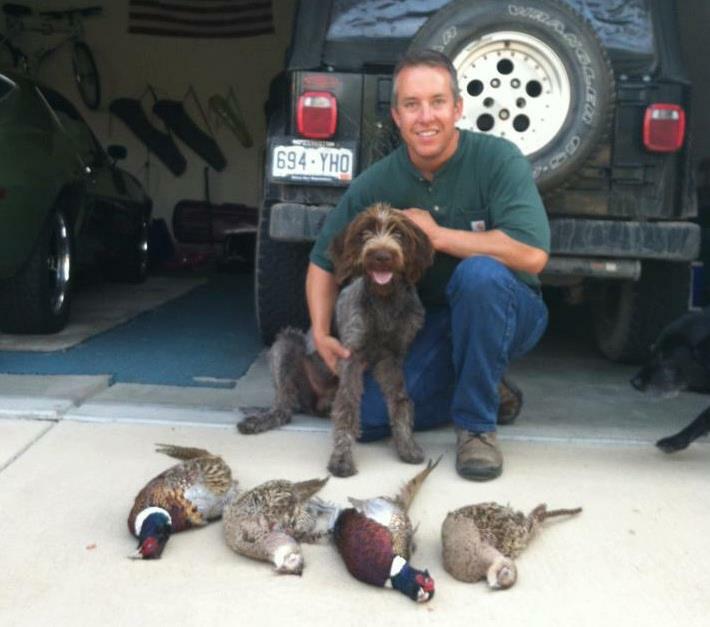 Mike out in Colorado has also been working with TracHer’s “twin” sister Frankie on some pheasants. 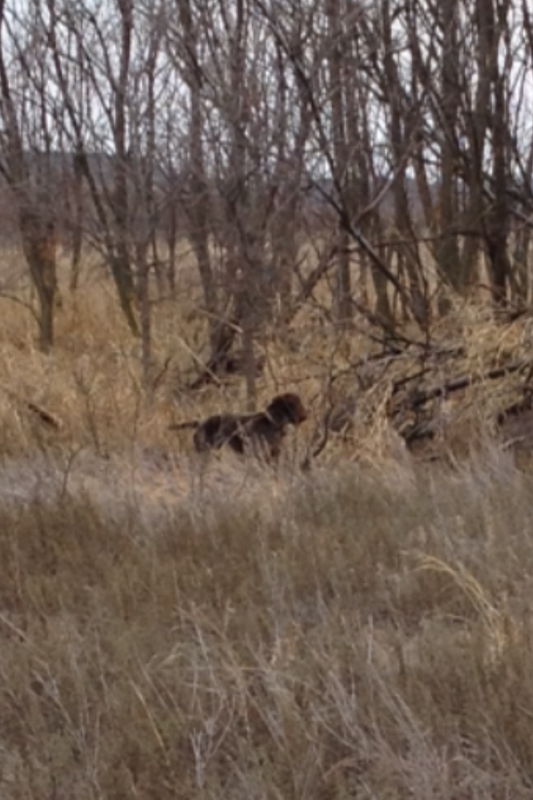 He’s been working on steadiness on the point and he says she’s doing a great job! 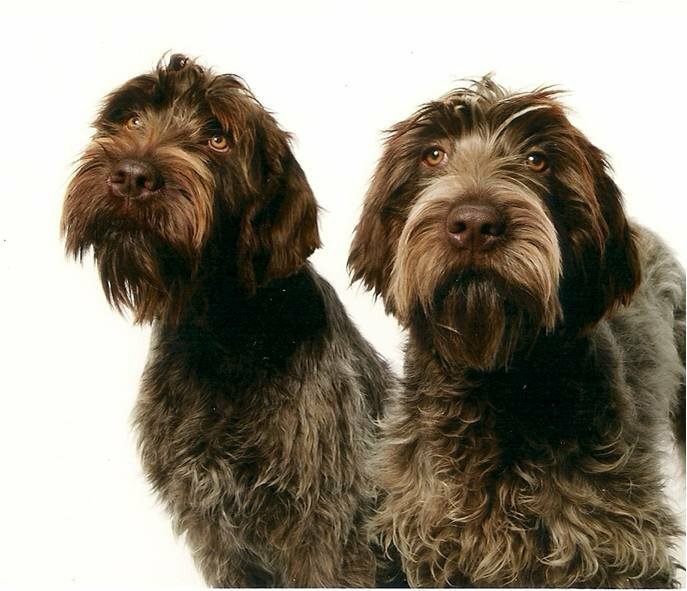 Both TracHer and Frankie are from our 2012 “C” litter with Sam and Mae. Mowgli is 18 months old and is from our 2011 “B” litter out of Sue and Sam. Quite the looker! I saw his brother Duke’s owner at the movie theater when I was taking the kids to see Finding Nemo 3-D, so hopefully I’ll get to see him soon. Well in less than a week, we’ll be headed back out to the Sandhills for some more hunting. There are no words for how terrible Eastern Nebraska has been this year thus far. The swamps are too dry for early teal and snipe, then the prairie chicken grounds have all been mowed for hay. Damn drought. We are going to have to start commuting to not only the Sandhills, but the Rainwater Basin of Central Nebraska, the pheasant fields of South Dakota and Southwestern Nebraska as well as the quail fields of Kansas. I hope that this is a temporary blip in the hunting situation in this part of the state because I don’t see us moving anytime soon. But we are in fear of this being the beginning of a total collapse in hunting in Southeastern Nebraska. Oh and one last thing, be sure to check out the new t-shirt designs on our Shop!! You can either click the button at the top of the page or go directly to http://www.wirehairedpointinggriffongear.com Buy a shirt to show your griffon pride, 100% made in the USA, from the shirt itself, the artists designs to the embroidery and screenprinting!! 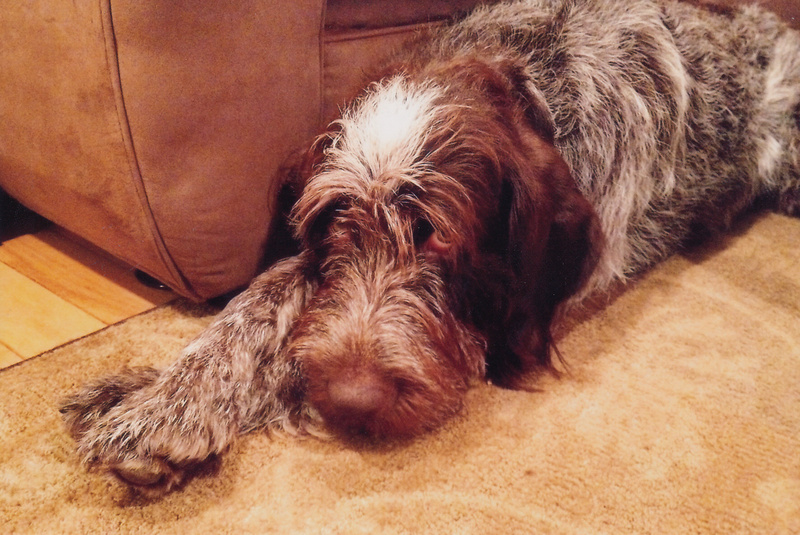 A couple of years ago I wrote a post about grooming the Wirehaired Pointing Griffon and to this day it is one of my most visited. As I’ve since learned more about the process, I wanted to provide my readers and others scouring the internet for information with my most up-to-date knowledge. Most of my grooming comes out of necessity, as my property is wooded and contains burr bearing plants. There are things that those grooming for show do that I don’t, which I’ll talk about at the end of my explanation. My grooming is very utilitarian and only very infrequently for the show ring, but I will talk about show grooming techniques later on. It is important to have good supplies. I’ve acquired my collection of brushes, combs, scissors and other necessities over the years, but would think that starting out with a complete set and knowing how to use them would be helpful for a relatively new griffon owner. Shampoo: For dogs under 6 months of age, I use a multi-purpose puppy shampoo of any brand. Once they are over 6 months, I use Hartz Flea and Tick Dog Shampoo. I do not recommend using the flea and tick shampoo within 2 weeks of having the dog’s coat evaluated, because it strips the oils from the coat. If you must wash the dog (like if it gets in the mud or something) within 2 weeks of going to a dog show or NAVHDA test where the dog’s coat is evaluated, use Bio-Groom Wire Coat Shampoo. I have yet to try it out, but I do have a bottle and know the vast majority of griffon owners swear by it. Due to my dogs spending so much time in the woods and field, I feel like I need to use the flea and tick shampoo in addition to my monthly flea and tick preventative regimen. Ear cleaner: My vet prescribes DermaPet Malacetic Otic solution, but any vet recommended ear cleaner should be purchased in the largest dispenser possible. Scissors: I have a round-tip pair with a 1″ blade if I need to trim around their eyes (I don’t like hair blocking their vision), then a normal pair of round tipped shears for the body and ears and a pair of thinning shears for flattening out anywhere it is not level for the show ring. I start out brushing the entire body of the dog with the wide-toothed burr remover, then repeat the process with the undercoat comb, then finish with the universal wire brush. I just purchased a grooming table over the summer and am really enjoying it, saves me all of the bending over from when I used to brush them on the ground. If the dog needs a bath, I then bathe them with one of the above listed shampoos, scrubbing them down with the rubber shampoo brush. I’m in the process of creating a spot in my garage stall (that I’m slowly turning into a dog room) where I will have a dedicated grooming tub that is elevated, but as of right now my dogs are bathing in the kiddie pool in the summer and the human bath tub in the winter. There are things that most griffon show groomers do that I do not due to our dogs spending most of their time in the field. I do not finger strip, use a stripping stone, knife or furminator on my dogs’ coats. 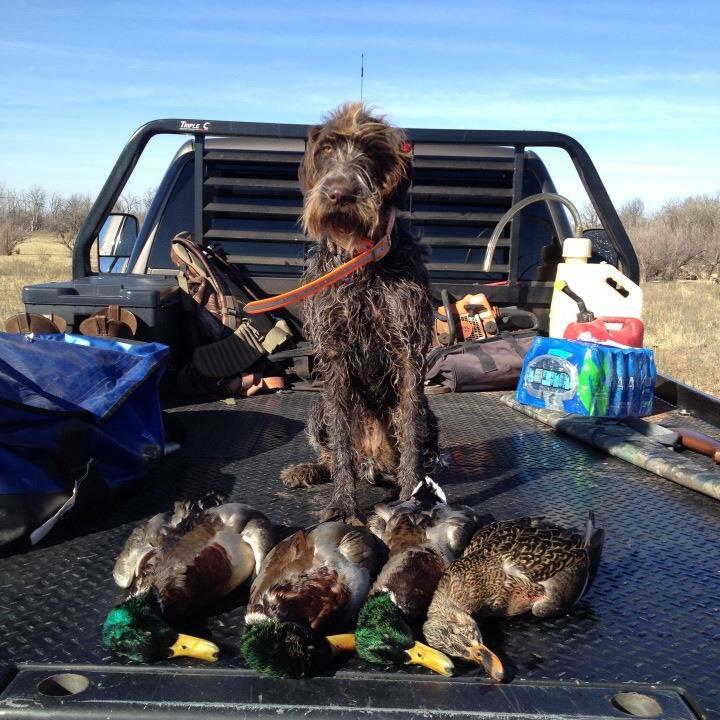 Once you’ve seen a dog hunt cattails for a few hours, you’ll know why. I do not pluck my dogs’ ears, so I end up cleaning them quite a bit. My vet recommended not plucking them to make sure that field debris does not end up in the ear canal; I have a friend whose lab has his eardrum punctured by dried grass last year. I have yet to learn how to clean my dogs’ teeth and right now rely on bones to keep them clean, but it is on my to-do list of things to learn (many folks have this done at their vet). I do not trim my dogs’ claws because they get naturally worn down in daily exercise. These are other things that you might want to think about and research elsewhere.